John and I have pretty much decided that 75 percent of their beef, although cheap, isn’t that great in quality. We’ve liked their chicken products every time, though. We weren’t terribly upset about the beef, after all what can one expect when they get 6, 10-ounce T-Bone steaks for $20? 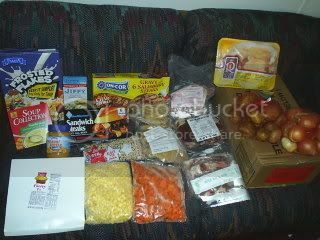 Anyways, Angel Food takes food stamps for those of you who need that and it’s really worth the time, money and effort, especially in these bad economic times. It’s about this hoity-toity woman who thinks she’s this wonderful socialite but really she just drives everyone absolutely insane. She has these “low class” relatives that serve to drive her crazy and embarrass her in just the right moments. It’s hysterical. 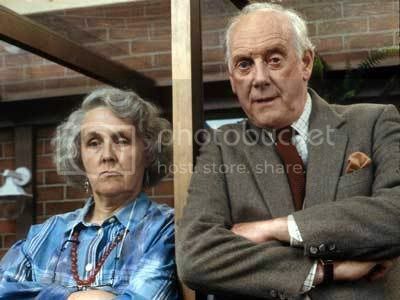 I really can see John and me being the “low class” relatives in about 20 years! 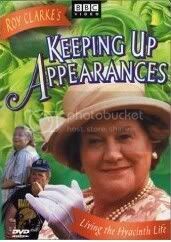 John also enjoys a third Britcom named “Are you Being Served” but I don’t get into it much. It’s about the staff at a department store and all their shenanigans. My third and final random thought from this weekend is about a new cologne I saw on TV this morning. 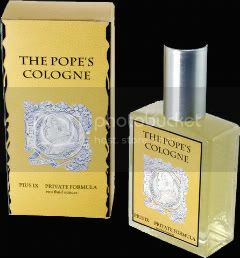 It’s called The Pope’s Cologne, I kid you not. At first I thought it sounded AWFUL, but when they described it, the concept was actually pretty cool. It turns out this doctor researched a pope during the 1800s and he believes he found the recipe for the pope’s cologne. This doctor makes the cologne in his home, with the help of several family members. He said (on the news show featuring his story) that he isn’t sure if it’s the name that turns people off or if they think it’s simply sacreligous. I can’t help but think it’s both, even though I’m not personally offended by the idea. So what name would you give the stuff to make it sell?